Our new ECO Dryer 2.0 HP uses heat pump technology to achieve effective and gentle drying. No extract ventilation to outside atmosphere is required, allowing for more simple and straightforward installation in any location. You can save up to 65% of energy compared to the vented models, making it by far the market’s most energy efficient drying cabinet. Noise levels have also been reduced. 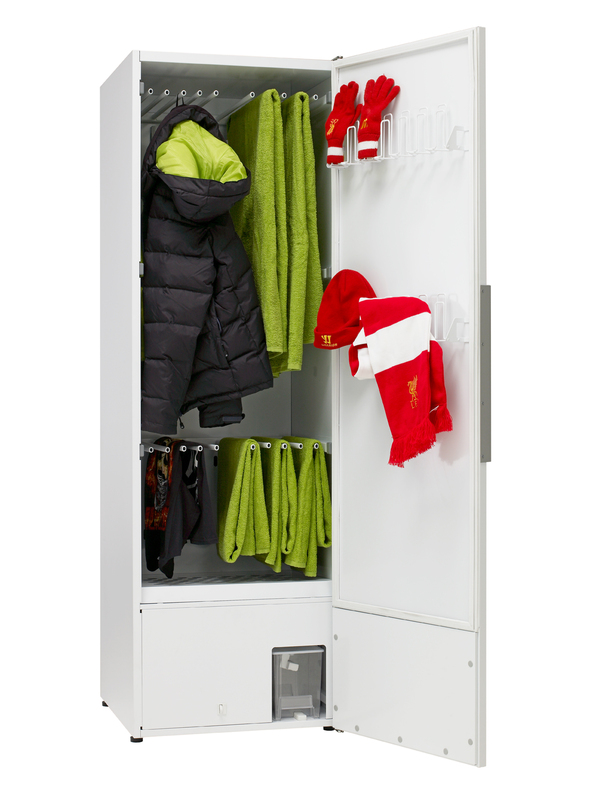 This versatile drying cabinet can dry anything from your usual washed clothes to wet boots, coats, hats and scarves, as well as delicate fabrics such as silk and wool. It comes supplied with 3 sets of hanging rails with the middle and lower rails able to fold backwards to allow longer garments, such as towels and sheets, to hang freely from the upper rails. The rails can slide out to assist with the loading process. Two glove racks are also supplied on the inside of the door. Two fully automatic programmes can be selected using the electronic LCD control pad. This drying cabinet can be housed inside a bespoke furniture cupboard. All Peko Drying Cabinets must be secured and levelled to a wall.